My fifth entry for my 10 films in 10 days is All the President’s Men (1976). 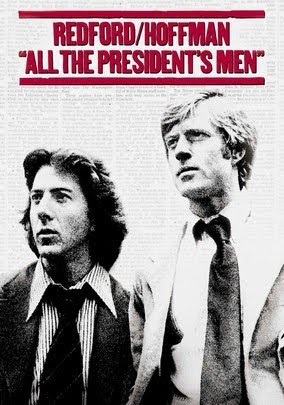 I can’t remember when I first saw this—it may have been not until college—but even though I was not particularly political as a kid nor particularly well versed on the details of Watergate, I was always fascinated by this film, even in my youth—I recall one day being with friends, trying to decide whether to see a movie, but no one was interested in seeing it when I suggested it, no doubt believing it was boring (I was 14 at the time). It’s a thriller without any violence or traditional “action scenes” and of course everyone knows how the story ends. But it’s how we get there that forms the spine and suspense of the film. The film has inspired generations of new reporters and made journalism look like a noble profession. In truth, journalism always has had a long rough-and-tumble history encompassing both serious news gathering and investigative work and partisanship and sensationalism. And today, most of broadcast and print journalism are part of large media conglomerates, part of the same establishment its supposed to cover and hold accountable, which does create a degree of conflict of interest. Nevertheless, the film demonstrates the importance the importance of holding investigative journalism and a free press in a democratic society—a democracy that actively seeks to undermine or delegitimize the press does so at its own peril. The film is an amazing piece of work, especially when one considers it was done so close after the heels of the actual events (Nixon had resigned only two years prior to the film’s release). It continues to be an inspiration of similar films that have followed, such as Shattered Glass, Spotlight and the recent The Post.